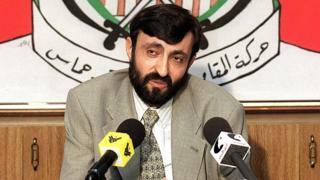 A senior Hamas figure in Gaza has been shot in the head in what the militant Palestinian group says was an accident. Imad al-Alami shot himself while "inspecting his personal weapon in his home" and was in a critical condition, Hamas spokesman Fawzi Barhoum said. Medical sources say Mr Alami, a former member of Hamas's political bureau who has close ties to Iran, is being treated at a hospital in Gaza City. There was no independent confirmation of the circumstances of the incident. Some initial reports suggested it might have been an assassination attempt. Mr Alami, who is reportedly in his 60s and is also known as Abu Hamam, was one of the founders of Hamas. In 2003, the US declared him a "specially designated global terrorist". It identified him as a member of the Hamas political bureau based in the Syrian capital, Damascus, and said he had oversight responsibility for the group's military wing in Gaza and the West Bank. Mr Alami also served for years as Hamas's main envoy to Iran, the group's main military and financial backer, according to the Times of Israel. The newspaper says he left Damascus for Gaza in 2012 - a year after the start of the war in Syria, in which Hamas leaders expressed their support for forces fighting Iran's ally President Bashar al-Assad. Mr Alani was then elected deputy leader in Gaza, a position he held until last year. During that time he largely stayed out of the press but he is known to have taken part in talks over a ceasefire with Israel and the release of the captured Israeli soldier Gilad Shalit, as well as efforts aimed at mending ties with Egypt and the other main Palestinian faction, Fatah. In 2014, Mr Alami is reported to have suffered serious wounds to his leg, for which he had to undergo surgery in Turkey. There were rumours that he was hurt in a clash between Hamas members, but the group insisted the wound was the result of an Israeli air strike during a conflict that year between Israel and militants in Gaza.